A rare pair of Federal era sofas offers insight into the period. In October 1795, George Washington appointed Elias Boudinot IV as the second director of the United States Mint in Philadelphia. Having already served in numerous government positions, Boudinot wanted to retire, but felt compelled to heed the call to service once again. He and his wife, Hannah Stockton Boudinot, had most recently been living in an elite enclave in Elizabeth, N.J., but when Elias was appointed at the Mint they returned to Philadelphia. There, they settled at their country estate, Rose Hill, just outside the city, rather than in a townhouse they owned on Arch Street. 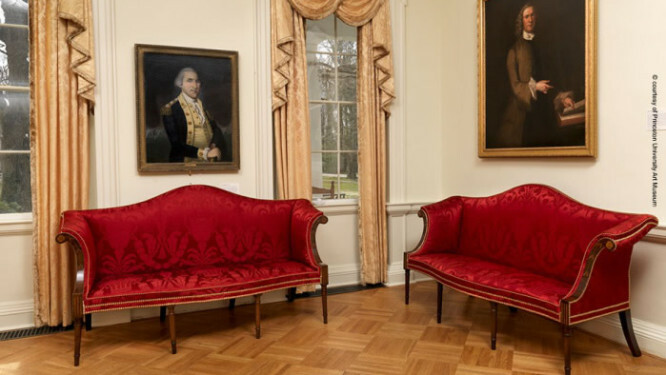 It was probably around this time that a matched pair of late 18th-century American sofas was acquired by the wealthy couple, possibly in connection with the refurbishment of the townhouse, or as part of a project to furnish the newer Rose Hill. Elias Boudinot IV and Hannah Stockton Boudinot, 1784, by Charles Willson Peale, American, 1741–1827. Oil on canvas, each 76 x 63.5 cm. Princeton University Art Museum, gift of Mr. and Mrs. Landon K. Thorne for the Boudinot Collection. As well-preserved and distinctive pieces of early Federal era furniture, the sofas offer special insights into stylistic design features and upholstery techniques and materials that are possibly unique for the period. As a form, the sofa—sometimes “sopha,” in period usage—can be found as early as the 17th century. It is an elongated chair, capable of seating more than one person, upholstered on its base, arms and back. Sofas differ slightly from settees, couches, chaise lounges and day beds, and were the most popular of these generally rare forms in Federal America (1788 through about 1820). A sofa’s great cost resulted from the fact that many craftsmen, such as cabinetmakers, upholsterers and makers of inlay and veneer were all involved it its creation, and from the furniture’s extensive use of fabric, which was very expensive at the time. This expense made sofas highly prized in America, even among the wealthy, and those who owned them often opted for less expensive haircloth or wool fabric instead of the rich silk damasks of the best European pieces. Examples of paired sofas are especially rare. American instances include those owned by Philadelphia financier Robert Morris, probably the wealthiest man in America during the 1770s–80s; statesman and lawyer John Dickinson of Philadelphia and Wilmington, Delaware; and Lewis Clapier, a merchant from Marseilles, France. Stylistically, the Boudinot sofas combine Chippendale and Federal period design characteristics, but varying the details of a piece of furniture to suit the customer was a frequent practice; price books from the period offered, for example, leg choices including straight, tapered, turned or flaring, either undecorated or with moldings, carvings or veneers. The legs of the Boudinot sofa match a set of heart-back chairs also in the Boudinot collection and made at approximately the same time, introducing the possibility that the couple may have commissioned both the sofas and the chairs when they returned to Philadelphia in 1795 and specified the sofas’ turned legs to match their furniture en suite. Armchair, ca. 1795, probably Philadelphia. Mahogany and ash, with modern red silk damask. Princeton University Art Museum, gift of Mr. and Mrs. Landon K. Thorne for the Boudinot Collection. For those who could afford it, Federal style dictated that all textiles in a room—chairs, curtains, pillows and slipcovers—match, and clients often supplied their own material to their upholsterers, coordinating the appearance of diverse pieces. The collection of Boudinot furniture now at Princeton is one of the best-documented and largest extant collections of early American furniture from a single family, but while the Boudinots and their peers aspired to stylistic currency and conformity, few could afford to discard entire rooms of furniture in older styles and replace them with new ones. Pieces were acquired as funds and circumstances permitted—in the case of the Boudinots, including inherited and official gifts received by Elias while serving the nation—and spanned a variety of styles and centuries of use and reuse. It is tempting to see the sofas’ amalgamation of rococo and classical forms as an effort to harmonize the various types. During the conservation of the Boudinot sofas in 2009, it was found that their workmanship is unusually sophisticated, suggesting a close collaboration between framemaker and upholsterer. For example, the measurements of the frames are calibrated to the standard loom width of the imported silk fabric with which the sofas were originally covered. This minimized waste and the necessity of piecing. Certain dimensions also seem to have been determined with consideration of the size of the brass tacks adorning the frames. These are very precisely accommodated throughout, as on the front sides of the arms, each exactly sized to neatly fit 11 tacks. The survival of the sofas in a fundamentally unaltered state is highly uncommon. Eighteenth-century upholstered furniture has usually undergone multiple alterations on account of the limited lifespan of woven materials and because of changes in fashion over time. Technological developments, such as the introduction of the upholstery spring in the mid-19th century, also led to wholesale retrofitting, but the sofas may have escaped major modifications due to their apparently infrequent use as the family’s best furniture. The only alterations identified on the Boudinot sofas are the well-executed wrought iron plates that reinforce a joint on one, and the fact that the two middle front and rear legs appear to be restorations on the other; it seems that the legs were either broken or removed for stylistic reasons and replaced with a single, centered leg. Because springs were never added to the seats, the original seat braces and corner blocks remain intact, but the most notable feature is the surviving upholstery. Although the original exterior upholstery, known as the “show cover” had long since been replaced with modern materials, substantial original upholstery foundation materials were preserved on each of the sofas, placing them among a handful of surviving American examples. The foundation materials build up the shape and definition of the finished work, making them as important as the frame and the show cover in determining overall effect. During examination of the pieces, unexpected boxed edges of raised upholstery—hidden by subsequent alterations—were discovered along the arms. It was a method of upholstering sofa arms that had never before been encountered by the conservators. Although the actual upholsterer of the sofas cannot be definitively identified, French émigré George Bertault practiced a raised-edge stuffing technique developed in France in about 1760 and known in America as a “French edge.” Active in Philadelphia between 1792 and at least 1800, he completed numerous documented projects, including furniture for George Washington, and it seems probable that Bertault or another French émigré was involved in the production of the sofas either directly or as the teacher of their actual maker. The exceptional state of preservation of the Boudinot sofas is fortuitous for American furniture studies. Distinctive for their combination of rococo and classical design elements, as well as their rare survival as a pair, the sofas yield significant new insight into period upholstery forms and techniques, providing an enhanced appreciation and understanding of the collaborative skill and stylistic ingenuity of early American craftsmen. This article is based on a longer essay by Cathy Coho, Anne Gossen, Thomas Heller and Karl Kusserow, “The Boudinot Sofas: A Rare Matched Pair of Federal Era Seating Furniture,” in Record of the Princeton University Art Museum, vol. 70 (2011), pp. 46-55, and is reproduced with the permission of the publisher. Cathy Coho is a textile conservator specializing in upholstery conservation. She lives in Philadelphia and works for local institutions and private clients. Anne Gossen is an independent museum consultant in Ithaca, N.Y., and the former Curator of Morven Museum & Garden in Princeton, N.J. Thomas Heller is the owner of Heller Conservation Services, near Nashville, Tenn. He specializes in the restoration and conservation of furniture, wooden objects, architectural ornament, works of art on paper and paintings. Karl Kusserow is John Wilmerding Curator of American Art at the Princeton University Art Museum, and edited the volume of essays on American art at Princeton from which this article was adapted.